Did George W. Bush Believe Iraq Invasion Fulfilled Biblical Prophecy? The recent GOP primary debates, in particular statements made by candidate Donald Trump, have once again placed the United States invasion of Iraq in the news. It was revealed in a 2009 GQ magazine article that Donald Rumsfeld as Defense Secretary embellished top-secret wartime memos with quotations from the Bible. Why did he believe he could influence President Bush by that means? The answer may lie in an alarming story about George Bush’s Christian millenarian beliefs that eventually came to light. In 2003 while lobbying leaders to put together the Coalition of the Willing, President Bush spoke to France’s President Jacques Chirac. Bush wove a story about how the Biblical creatures Gog and Magog were at work in the Middle East and how they must be defeated. “This confrontation is willed by God, who wants to use this conflict to erase his people’s enemies before a New Age begins”. The story of the conversation emerged only because the Elysée Palace, baffled by Bush’s words, sought advice from Thomas Römer, a professor of theology at the University of Lausanne. Four years later, Römer gave an account in the September 2007 issue of the university’s review, Allez savoir. The article apparently went unnoticed, although it was referred to in a French newspaper. The story was later confirmed by Chirac himself in a book, Si vous le répétez, je démentirai...Chirac, Sarkozy, Villepin published in France, by journalist Jean Claude Maurice. Chirac is said to have been stupefied and disturbed by Bush’s invocation of Biblical prophesy to justify the war in Iraq and “wondered how someone could be so superficial and fanatical in their beliefs”. In the same year he spoke to Chirac, Bush had reportedly said to the Palestinian foreign minister that he was on “a mission from God” in launching the invasions of Iraq and Afghanistan and was receiving commands from the Lord. 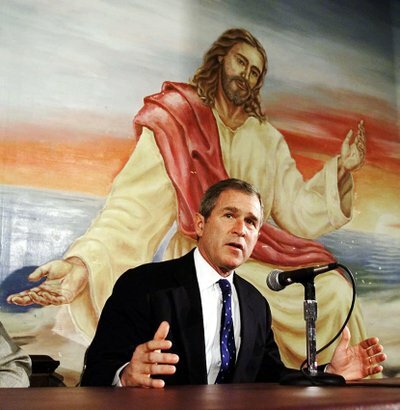 There can be little doubt that President Bush’s reason for launching the war in Iraq was, for him, fundamentally religious. He was driven by his belief that the attack on Saddam’s Iraq was the fulfillment of a Biblical prophesy in which he had been chosen to serve as the instrument of the Lord. Many thousands of Americans and Iraqis died in the campaign to defeat Gog and Magog. That the US President saw himself as the vehicle of God whose duty was to prevent the Apocalypse only inflamed suspicions across the Middle East that the United States was on a crusade against Islam.